Who says they love Paris in the springtime? La Mom does -- when the temperatures get above 60°F, that is. 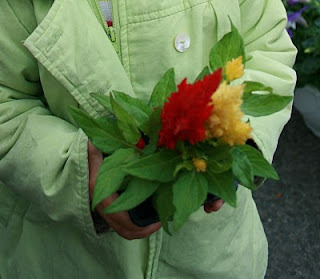 But this colorful flower market in Dordogne got La Mom's green thumb itching, malgré the chilly weather. Happy (windowbox) gardening to all of you Parisians! Hi La Mom! I'm a young teen in NYC, and I love your blog. Check mine out if you have time, I'd love to hear your feedback. I'm going to live in Europe for the next few years, so reading your blog has given me a taste of what life is going to be like there (cause I know it's different from vacationing there). I have the Paris weather on my iPhone and was looking at it last night thinking, "Wow it's still rather chilly there!" In all my trips, I have never had the pleasure of seeing everything in full bloom (or even not needing a heavy coat) as I tend to visit in the cooler, less expensive months! The French sure do know how to do flowers! I guess I left Paris a week too early too see them all like that. I keep coming back to your blog! I love visiting Paris, but as a new mother I won't be there anytime soon. Your blog helps to ease my Paris withdrawal symptoms. What is it like in Dordogne? Great blog, love the flowers. I am a flower lover myself. I love a good window box....have a happy weekend La Mom, xv. thanks for this little "bouquet" from france! Your comment about the weather makes me think of my trip to Paris over spring break when I was in High School. My mom and I kept singing "April in Paris" and laughing about it because we were freezing our buns off in the rain! I love your photos of these Paris blooms! Just gorgeous! Happy Spring LA Mom! Such lovely sights, Oh I wish I were there.